I like controlling things with my mind. That's why I do this brain-computer interface (BCI) thing. The tough part of BCIs, though, is finding brain signals that are simple enough for the computer to detect, yet are also something that I can consciously control. So far, I can do eyes-closed Alpha waves, concentration-controlled Beta/Gamma, and steady-state visual evoked potential (SSVEP). I need more options. Today, I'm going to try to do auditory steady state response (ASSR). Or, more colloquially, does my brain got beats? 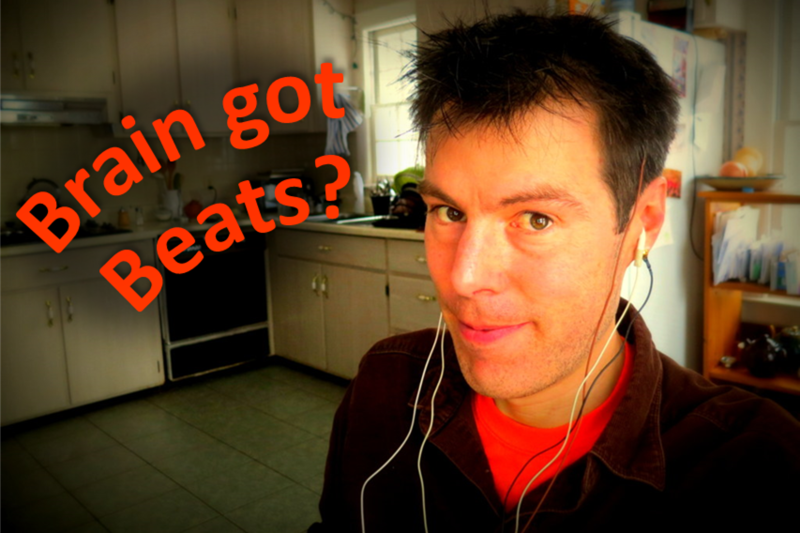 Can I use beating tones to entrain brainwaves? The idea with ASSR is that we are looking for EEG signals from my brain that are driven by sounds presented to my ears. When doing an ASSR, you use an audio tone whose amplitude is varied ("modulated") at a fixed rate such as 40 Hz. Then, when you play that sound in your ears, you look in the EEG signals for a strong 40 Hz component. Easy, eh? Note that this is very similar to the steady-state visual evoked potential (SSVEP) that I used previously, where I'd make my computer screen blink at 8 Hz and 8 Hz signals would appear in my EEG. 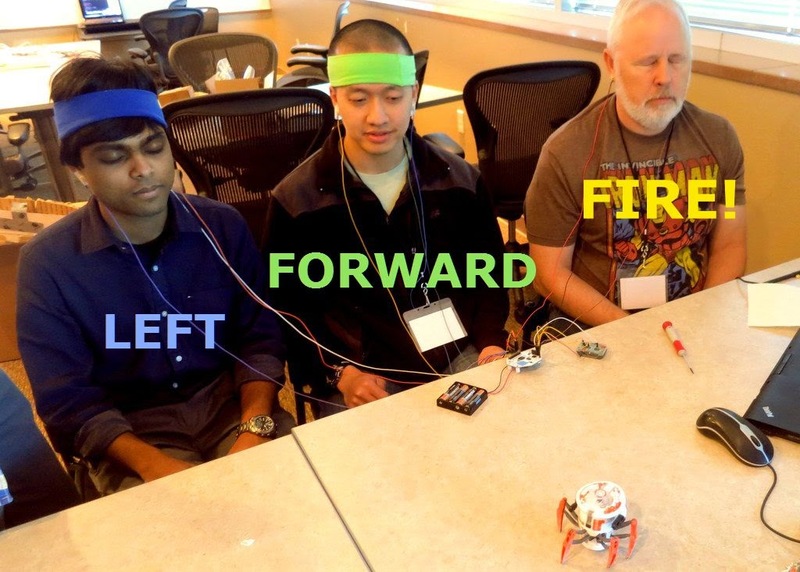 If I want to use ASSR for a brain-computer interface (ie, for controlling robots! ), there needs to be some way to consciously control my response to the sound. For the SSVEP, where stimulation was my blinking computer screen, my response was much stronger if I consciously paid attention to the blinking screen. This attention-based response was the key to being able to exploit it for a BCI. Does ASSR have a similar attention-based component? Until yesterday morning, I didn't know. But then I came across this paper: Do-Won Kim et al. "Classification of selective attention to auditory stimuli: Toward vision-free brain–computer interfacing". Journal of Neuroscience Methods 197 (2011) 180–185. PDF here. In the paper by Kim, they used two loudspeakers to present tones to the test subject. The setup is shown below. The subjects were sitting down in a comfy chair listening to the tones while wearing a small montage of EEG electrodes (Cz, Oz, T7, T8, ref at left mastoid, ground at right mastoid). For the audio tones, they used a 2500 Hz tone from one speaker and a 1000 Hz tone from another speaker. The key feature of ASSR, though, is the modulation of these tones. For one of the tones, they varied the amplitude of the tone (ie, they alternately made it quiet and loud) at a rate of 37 Hz, while the other tone they modulated at a rate of 43 Hz. These frequencies are the "beat rates" for the audio. It is the 37 Hz or 43 Hz beat rate that they are looking for in the EEG (hence, "brain got beats?"). 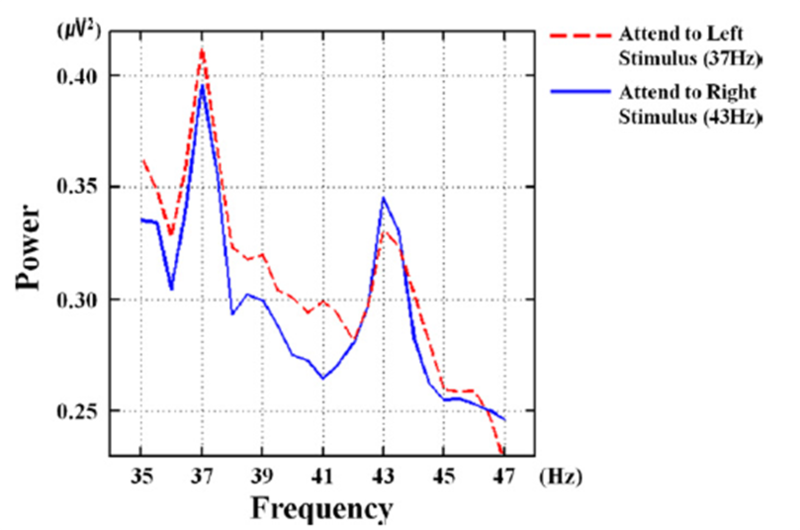 Below is what they saw in the EEG signals (Cz) for one of their subjects when the subject gave their attention to the 37 Hz modulated signal (red) or the 43 Hz modulated signal (blue). There is clearly a difference. This makes me happy. This is what I want to recreate with my own testing. Tones that were Amplitude Modulated at 37 Hz or 43 Hz. I want to recreate their results. 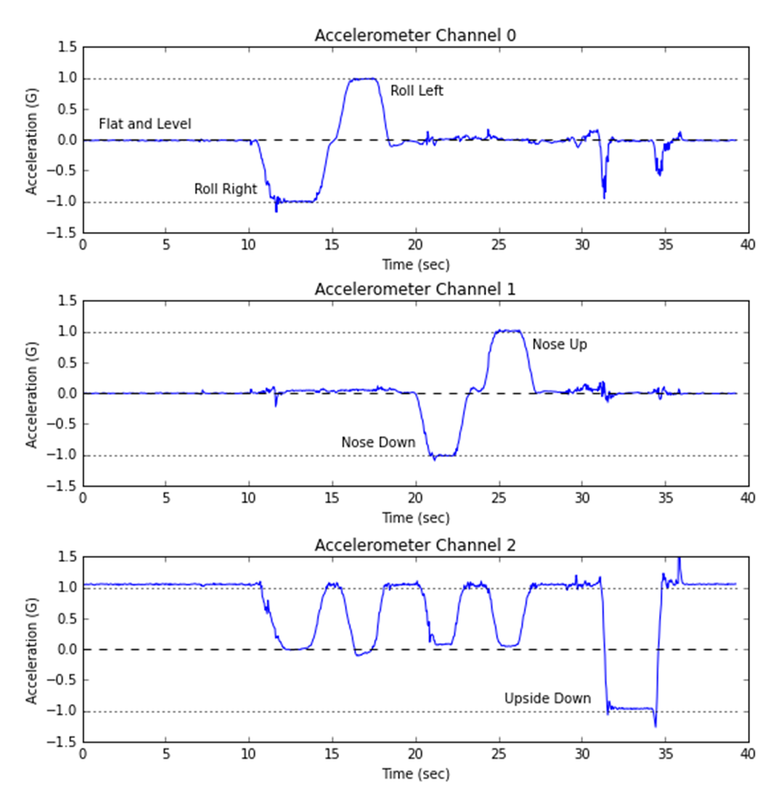 I'm going to create some audio files with the amplitude modulated signals, I'm going to play them into my ears via headphones, and I'm going to record my EEG signals (OpenBCI!) to look for my ASSR. EEG Setup: Reading more details from the paper, they said that they got the strongest response from the electrode at Cz, so I decided to start there. I put one electrode at the top of my head (Cz) with the reference on my left ear lobe and the OpenBCI "bias" on my right ear lobe. I used the gold electrodes and the Ten20 EEG paste that came with the OpenBCI kit. Without really trying, I happened to get an electrode impedance of 20-30 kOhm at both Cz and at the reference, which are probably good enough. stead of loudspeakers to present my tones. 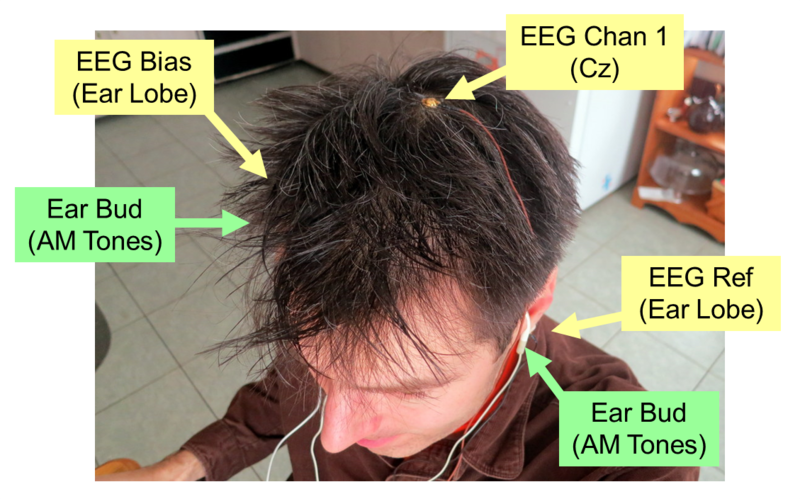 OpenBCI EEG System: For this test, I happened to use my 16-channel OpenBCI system. I'm only using one channel of EEG data, though, so I could have used the 8-channel systems (or even other systems, like OpenEEG) just as well. I wired up my OpenBCI unit as shown below. Starting from the left, the white wire is the "bias" (aka, driven ground) going to my right ear lobe, the brown wire is the electrode at the top of my head, and the black wire is the reference electrode on my left ear lobe. Note that they are all plugged into the lower row of pins (the "N" inputs) on the lower board. The system is being powered by four AA batteries and is sending its data wirelessly back to the PC. I'm using the OpenBCI GUI in Processing. Here's How I Plugged into the OpenBCI Board. Audio Files: I created my audio files in Audacity. I created two sets of files, based on the frequencies used in the Kim paper: one set of files using a 1000 Hz tone and the other set using a 2500 Hz tone. The Kim paper said that the strongest ASSR generally occurs for a beat frequency of 40 Hz. I wanted to see my response at different beat frequencies, so for each tone I created three versions: one beating at 38 Hz, one at 40 Hz, and one at 42 Hz. I made each version 20 seconds long. I used a square wave (ie, on/off) amplitude modulation, though next time I might try sine wave modulation instead. tone. Then, to do the AM, go under "Effect" and select "Tremolo". Data and Analysis Files: My audio files, my data files, and my analysis files are all on my GitHub here. Note that I did my analysis using an IPython Notebook (see it here). My specific Python installation is described here. My goal is to see if I exhibit the ASSR response with this test setup. To do the test, I wired myself up as discussed above, I queued up all six audio files (the three at 1000 Hz followed by the three at 2500 Hz), put in my ear buds, and started recording. 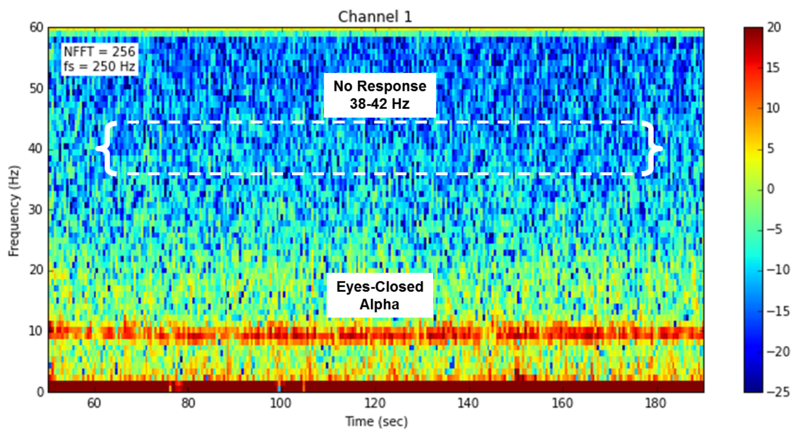 Eyes Closed: The spectrogram below shows my Cz EEG signal when I did this test with my eyes closed. That strong red stripe at 10 Hz is my Alpha response simply due to having my eyes closed. What I do not see here are horizontal stripes of energy at 38, 40, or 42 Hz. In other words, I do not see any brain waves entraining with the audio stimulation. This is disappointing. 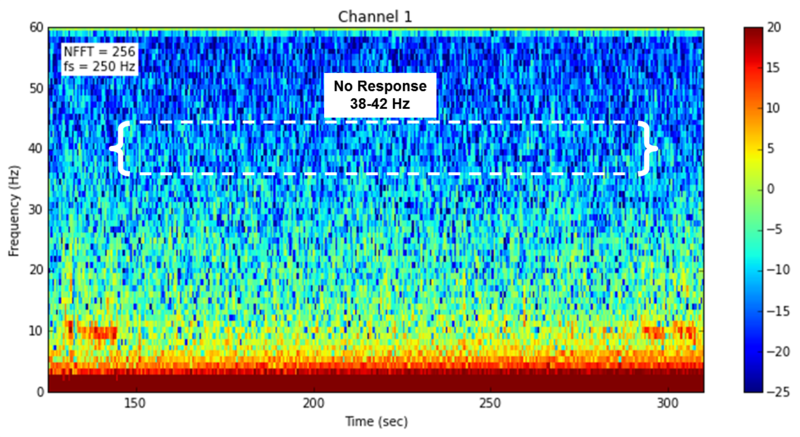 Spectrogram of EEG Signal from Cz with AM Auditory Stimulation Near 40 Hz. My eyes were closed, hence the strong response at 10 Hz. There is no signature of the 38-42 Hz AM Audio Stimulation. Eyes Open: I also performed this test with my eyes open. A spectrogram of my EEG signal at Cz is shown below. I started and ended the test with my eyes closed for 10 seconds, which you can see as 10 Hz Alpha waves at the start and end. What I really want to see, though, is something corresponding to the audio stimulation at 38 Hz, 40 Hz, or 42 Hz. Again, I see nothing. My eyes were open, except at the beginning at end. Average Spectrum: To most closely mimic the plot from the Kim paper (ie, the graph that I copied earlier), I plotted the average spectrum. In the Kim plot, there were clear peaks at his two beat frequencies (37 and 43 Hz). 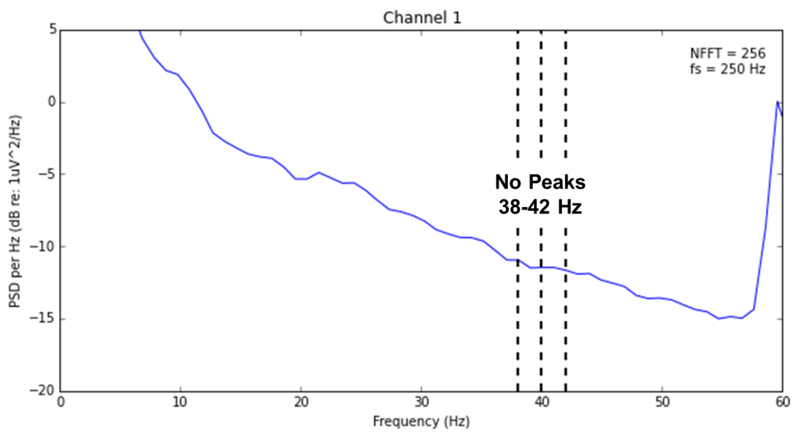 In my equivalent plot below, there are no peaks at the three beat frequencies that I studied (38, 40, and 42 Hz). with the 38, 40, and 42 Hz AM auditory signals. Bummer. Conclusion: So, it is clear that i did not see any ASSR in my EEG recordings. This is very disappointing to me. In looking back at his plot with the spectrum from one of his subjects (copied earlier in this post), I see that the y-axis is a linear axis, whereas I always do dB. What might his values look like when converted to dB? As an example, I see that his first peak is 0.40 uV^2, relative to a baseline of about 0.30 uV^2. 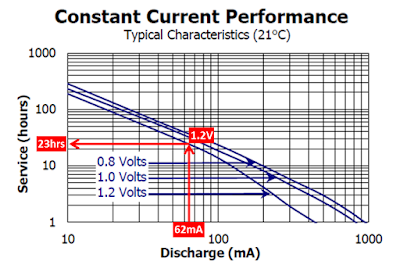 Converted to dB (re: 1 uV^2), this would be -4.0 dB and -5.2 dB. Comparing to my own spectrum plot above, where my baseline is about -10 dB, any peak at -4.0 dB should be easily seen. Therefore, if my own response were as strong has Kim's subject's response, I would think that I would see the response in my plots. I don't see the peak, so I guess that I didn't have the response as strongly as Kim's subject. Perhaps the "gotcha" here is that the difference in Kim's data between the peak (-4.0 dB) and the baseline (-5.2 dB) is only 1.2 dB. That is a really small difference. For reliable detection, I generally like to see 6-10 dB of difference. 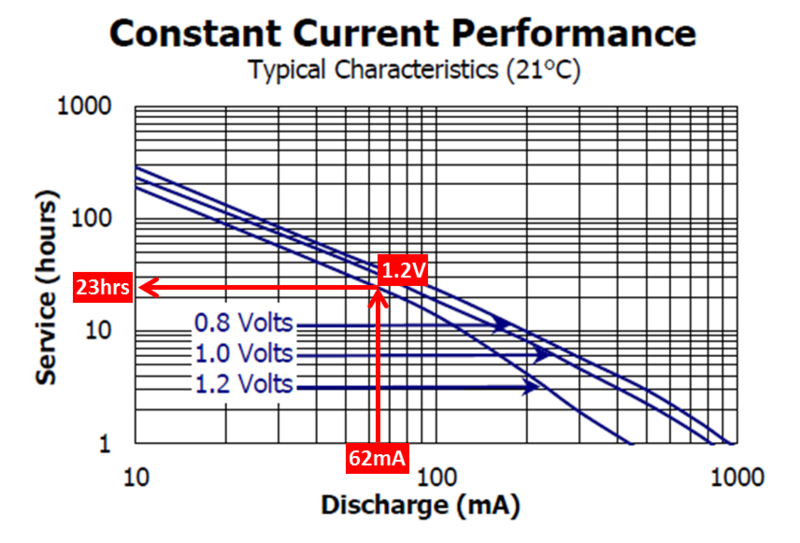 It might be too much to hope to reliably see only a 1.2 dB difference. I'm not going to give up yet. I'm going to try again. I'm going to try using the additional EEG electrodes as used by Kim and I'm going to try to use sine-wave modulation instead of square-wave modulation. I want to see this response! 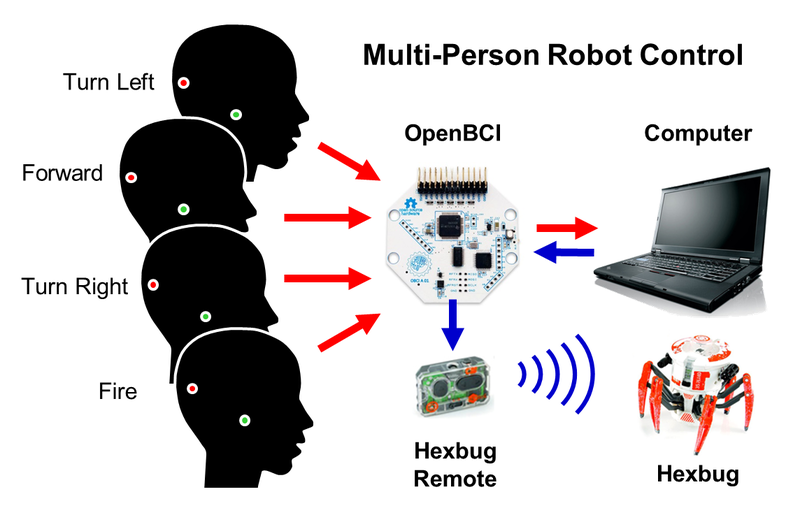 For a while now, I've been using the 8-channel version of OpenBCI. You can see some of my EEG data here and some of my accelerometer data here. 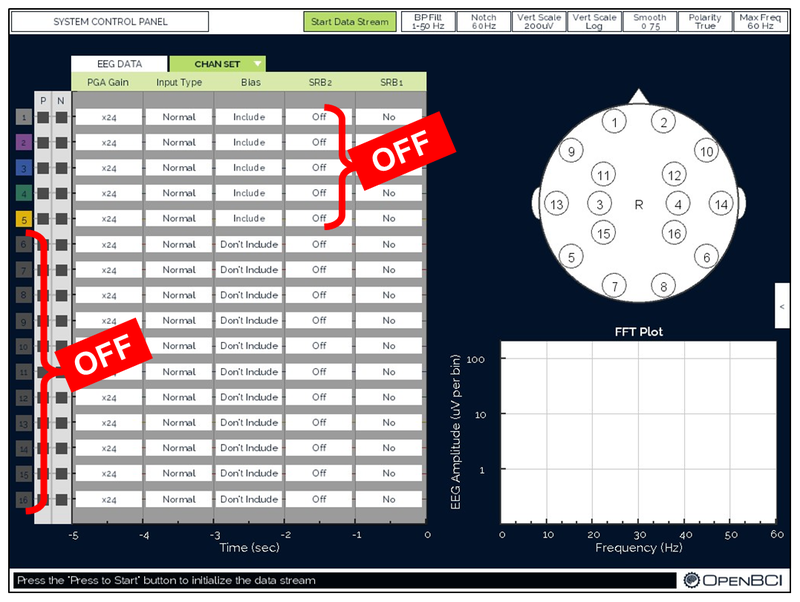 Recently, I've been interested in getting more EEG channels, which means that I have turned my attention to the 16-channel version of OpenBCI. 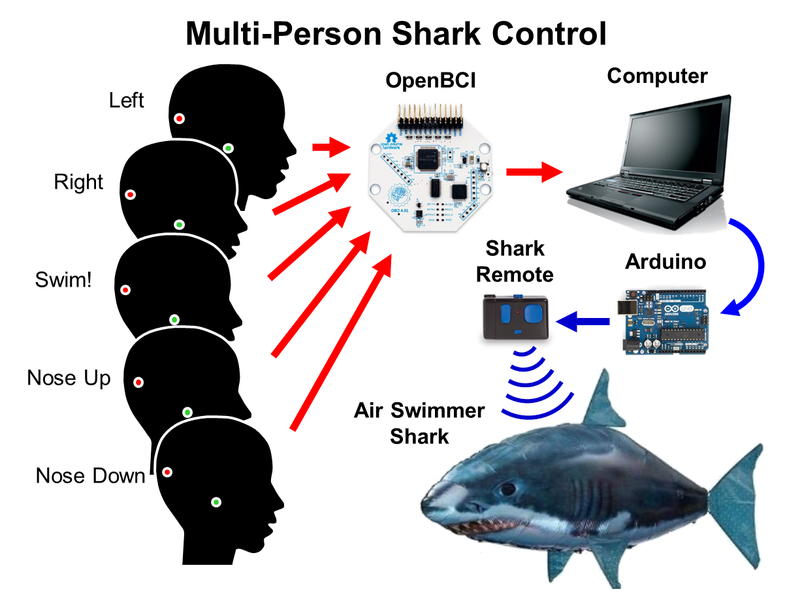 The 16-channel version consists of a single 8-channel OpenBCI board with a additional "Daisy Module" to provide the additional 8-channels. 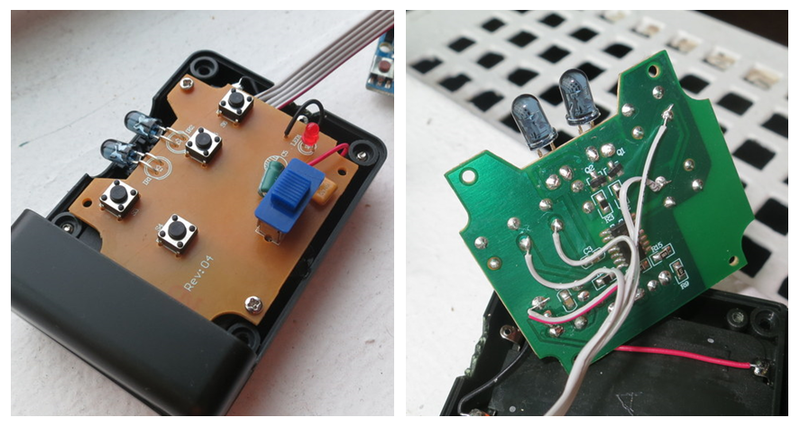 Today, I'm going to show a few pictures of the soldering necessary to assemble these two boards into a working unit. with their male and female headers (bottom). 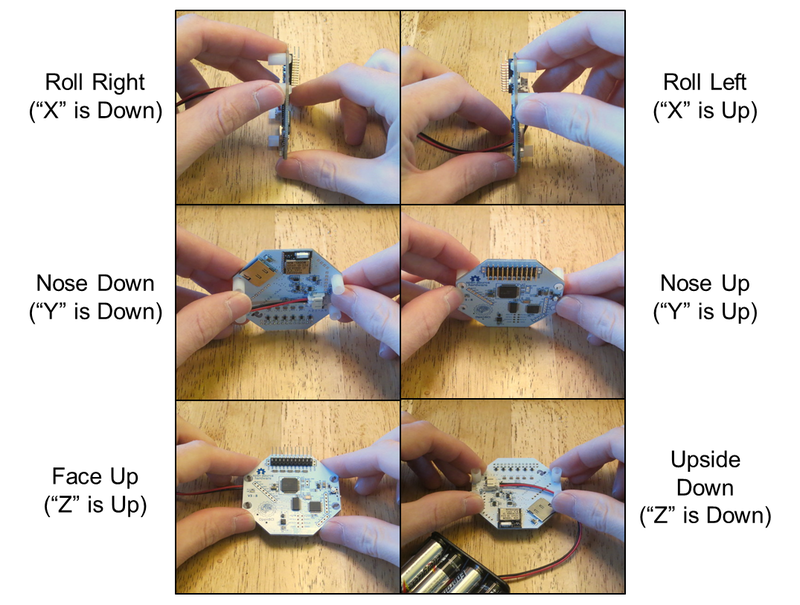 I started the assembly process by reading through the assembly instructions (with its pictures) as provided on the OpenBCI website. Those instructions were good, though I thought that some additional illustration would be helpful to others. Hence, the reason for today's post. Parts and Components: As you can see in the picture above, the OpenBCI boards themselves are fully assembled. But, like many Arduino-style kits, you do need to solder on some pin headers in order to connect the boards together. 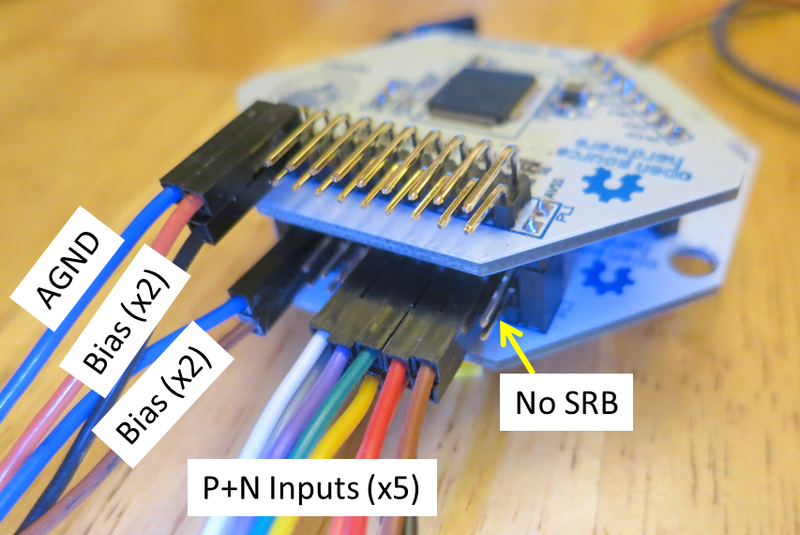 To make this easy, I found that the OpenBCI kit comes with the correct male pin header for the Daisy module as well as the correct collection of female headers for the base OpenBCI board. Great! A Trick for Soldering Headers: I started by looking to solder the female headers to the base OpenBCI board. Based on my experience soldering headers to various Arduino kits, I know that soldering the female headers can be annoying because it is hard to hold the header in place while your two hands are already busy holding the soldering iron and the solder. To overcome this problem, I used a trick that I saw a while ago where you use a solderless breadboard to hold your female headers vertically in place, hands-free. It's pretty sweet trick. 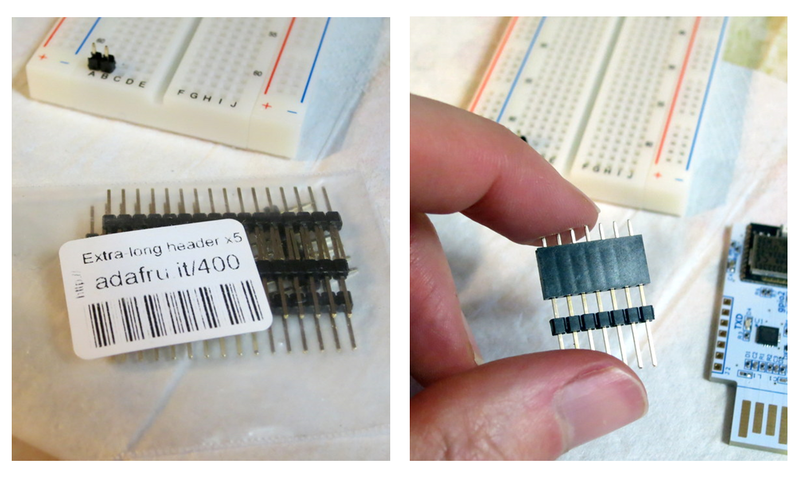 In addition to a solderless breadboard, you need some cheap double-ended pins (see below left). 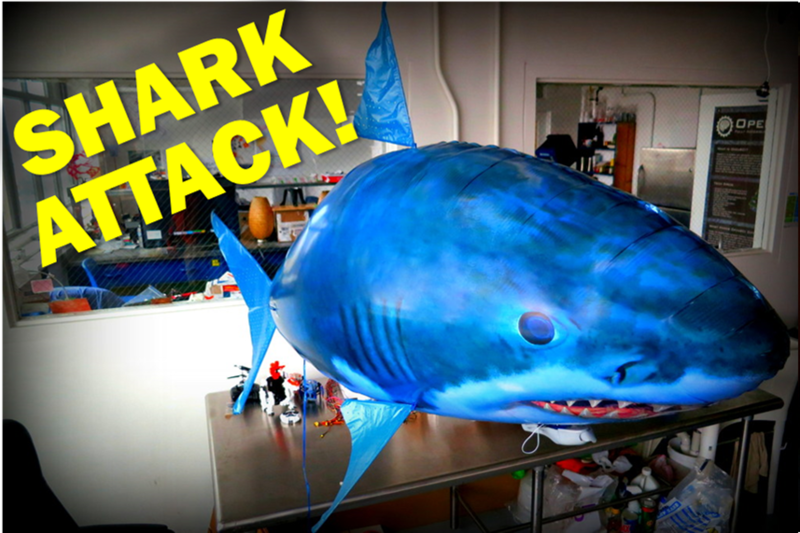 I got mine from Adafruit, but they are standard items available from a number of vendors. I only ever this pins for this soldering trick, so I bought them once and they've lived in my toolbox ever since. the top of the female header get soldered into the OpenBCI board. As seen in the picture on the right, above, you stick the extra-long headers into the female header that you are looking to solder to the OpenBCI board. Then, as shown in the picture below, left, you stick the extra-long headers into the solderless breadboard, which leaves the short pins (which are the solderable part of the female header) sticking up in the air. 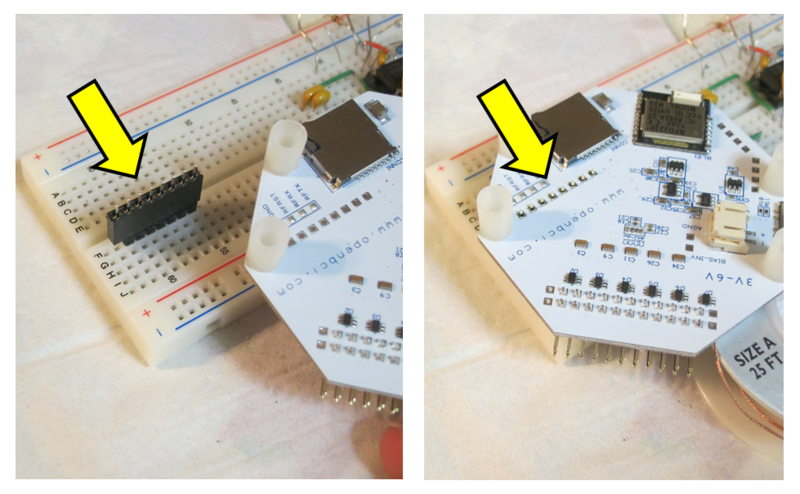 Use the extra-long pin header to hold the female header onto the solderless breadboard. solder pins of the female header. You're ready to solder those pins! Soldering the Female Headers: Now, you can place the OpenBCI board over those solder pins (see the right picture, above). 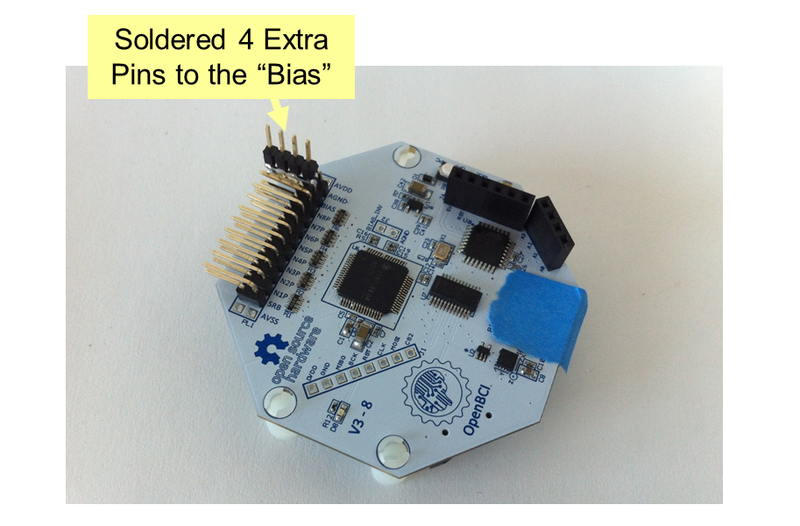 Note that the OpenBCI board has been flipped over so that it is face-down. It's important that you solder the header onto the correct side of the board! Once you have confirmed that everything is sitting correctly, you can start soldering. Soldering each one of the pins in this header. Then repeat for all of the other headers. After repeating this process for all of the other female headers, the base OpenBCI board is fully prepared. 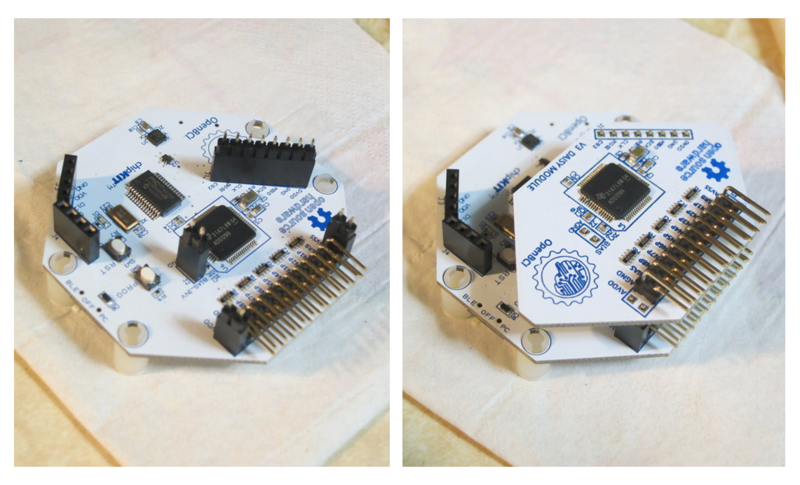 The base OpenBCI 32-bit board is finished. Preparing the Daisy Module: With the base OpenBCI board finished, I turned to the Daisy module. Here, you start but using your pliers to snap apart the single, long, male pin header into the smaller pieces needed to fit into the different spots of the Daisy module. into the correct number of pieces. Use the Base Board as Your Fixture: Then, as before, it can be tricky to solder these headers when your hands are full with the soldering iron and solder. 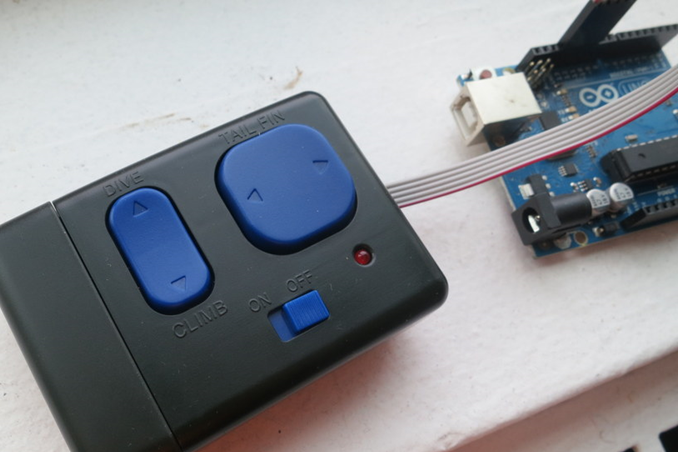 The tick this time, is to use the base OpenBCI board itself as your fixture. This is a classic trick for soldering Arduino shields. As shown in the picture below, left, insert the male pin headers into the base board's female headers. Do this for all of the male headers that you will solder to the Daisy module. Once they're in place, you can simply place the Daisy module onto the pins (see below, right) and everything will be nicely aligned and ready to solder. on top so that you can solder the pins into the Daisy board. Solder the Daisy Module: With the pins all in place, solder the headers into place. With everything so nicely held, this part is fast! For me, it went so quickly that I forgot to solder one of the headers into place. Ooops! So, I went back and soldered the remaining pins. No problem. Ready for EEG: With the last soldering complete, the two boards are mated and I'm ready to collect 16-channels of EEG. This is gonna be fun! Follow-Up: I measured the power draw of the system here. Sure, Joel and Conor did send me an early unit for me to test for them, but yesterday I received my actual purchased unit. 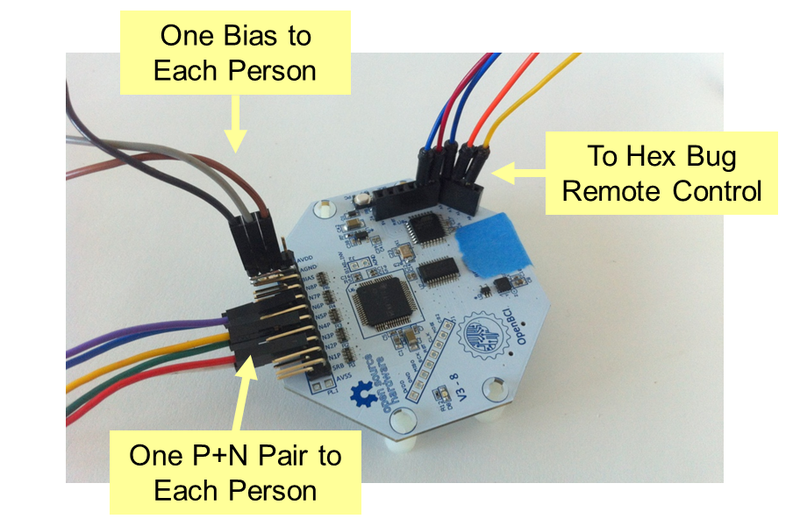 For their Kickstarter back in January, I choose the "OpenBCI Board -- Early Bird Special". Based on their description, I thought that I'd get just the OpenBCI board. It turns out that I got quite a bit more! As you can see in center of the picture above, I got the OpenBCI board (8-bit version) as well as the USB Bluetooth dongle. That was expected. Looping around the outside are all the extra pieces that I didn't expect. Starting from the left side of the picture, I got: a 4xAA battery holder, an OpenBCI sticker and sew-on patch, an OpenBCI T-Shirt, a set of electrode adapters, and two little bags of solderable female headers (for expanding the functionality of the OpenBCI board and of the dongle). That's some good stuff!